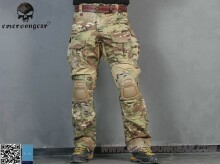 EMERSON G3 Combat Pants is designed as a no-compromise assault uniform, these pants are aggressively cut for maximum mobility. These combat-proven pants are sized in 2-inch waist increments and multiple lengths for a perfect fit. Constructed by 35%Cotton 65%Polyester, high performance synthetic knit torso, suitable for high rate movement. Unique low-profile waist adjust system. 10 different sizes pockets on the pants for convenient using. Dedicated knife / light holder that still allows pocket access. Simple knee pad height adjuster located in front thigh pocket. 2 velcro tab cargo pockets with small pocket inside. 2 velcro tab small pockets on upper legs. 2 velcro tab small pockets on bottom legs. Click the button below to add the EMERSON G3 Combat Pants (Multicam) with Detachable Knee Pads to your wish list.